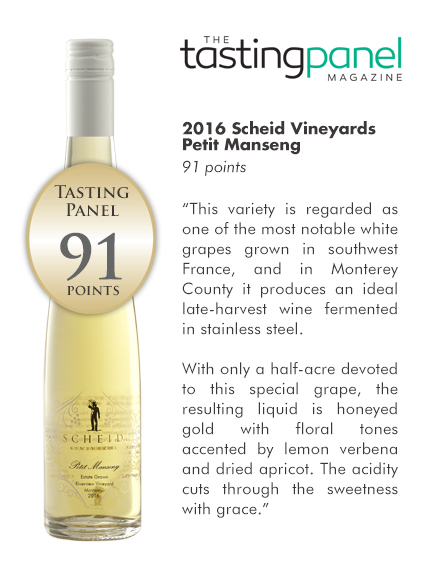 "Monterey County's Scheid Family Wines shows its experimental side in producing varieties uncommon in California." Of the 23 unusual varieties we've planted on our Riverview, Mesa del Rio, San Lucas, and Hames Valley properties—11 estate vineyards over 4,000 acres within a 70-mile span—we're currently bottling ten as single-varietal wines under our namesake label, Scheid Vineyards. Among the most successful of the esoteric bottle releases have been the Grenache Blanc and the Grüner Veltliner, as well as the Tannat, the Portuguese variety Touriga Nacional, and the Petit Manseng. Above all, the prevailing goal of this experimental project is to channel the distinctive character of Monterey County into the wines, not to simply mimic the winemaking style of the varieties native regions. Read more of the full article from The Tasting Panel.